Discussion in 'Desktop Vaporizers' started by Madri-Gal, Apr 16, 2019. My poor Arizer Extreme Q has been utterly neglected while I played with my new portables, my Solo and Air. It's entirely the fault of Arizer for making such a fine line of vaporizers I've gotten my Extreme Q back in heavy rotation, and she's got me on my knees. The EQ is a solid desk top that can do both balloons and whips, and do both well. Volcano seems to be the Bag King, but this is a Fair Prince at a more than fair price. Even stock, you have a workhorse. Throw on a @ddave mod and it's to the moon Alice. My love of adapters came from all of the magical bits and bobbles that transform the EQ into the Vape Of My Dreams. With a 14mm wand, you can even micro-dose, for those so inclined. With a water pipe adapter, you can enjoy your enviable glass collection. I like pulling in the colored whips from 7th Floor, and right now I'm using a Helix chillum from Grav as my mouthpiece. Killick, just_tHe_fLu, BD9 and 2 others like this. My son calls his q the fartbox...............lolz. Not sure how or why but he says it smells like farts and he hates it. I suggested he clean his glass and whip but..............lazy is as lazy does. I rarely use ours but it certainly cranks out the vapor. just_tHe_fLu, Madri-Gal, BD9 and 1 other person like this. I'm not afraid to break out the whip, when the occasion calls for it. You need to tell that boy no one wants to put their mouth on dirty equipment. He's being a Naughty Boy. just_tHe_fLu and arb like this. He certainly needs some..............discipline in his life. Killick, just_tHe_fLu and Madri-Gal like this. He just needs to clean it up, and whip it good. BD9, arb and Madri-Gal like this. 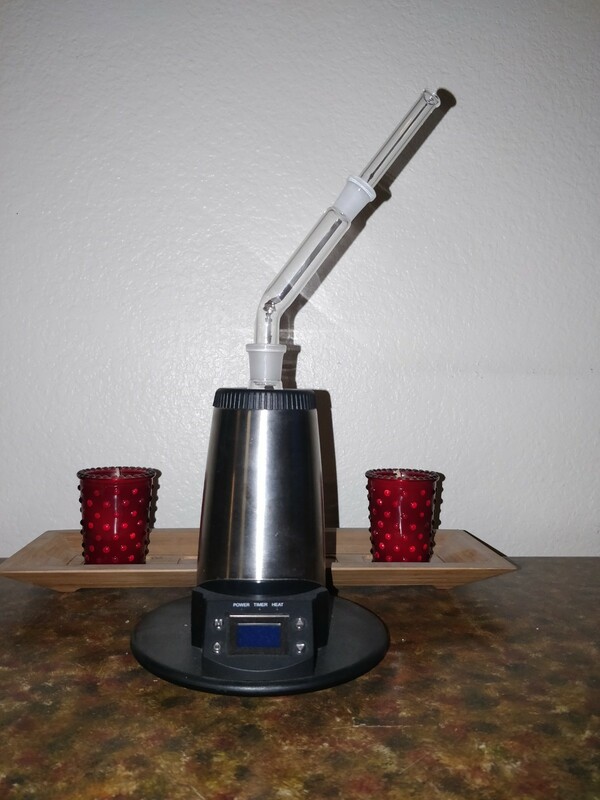 It is time again for rejoicing, Arizer Extreme Q fans. BD9, Killick, just_tHe_fLu and 2 others like this. - Are You Wanting to Improve the Functionality of Your Wand? - Do You Ever Wish Your Wand Were Bigger? - Or That Your Wand Were A More Pleasing Shape? - Do You Ever Wish To Use Your Wand In A Different Way? - Do You Want To Try It Without A Whip? - Do you Want It Different, But Still LoveThe Whip? - How Does No Whips, No Bag Sound? - Or Do Balloons Make You Swoon? - Do You Want To Be On Your Way To Better Bagging? - Have You Ever Wanted To Vape With No Hands? - Do You Like To Get Down And Dirty When You Vape? - Do You Like A Long, Wet, Soak Before Bed? Together, They Are The Latest In A Series Of Mods by The Esteemable @ddave Of DDaveMods, Designed To Enhance The Performance of Your Arizer Extreme Q and Your Arizer Tower. BD9, momofthegoons, just_tHe_fLu and 1 other person like this. I feel scared yet strangely excited..................hold me. designed to enhance the Functionality and Versitility of your EQ or VTower. Both The Gentleman and The Dirty Pig were designed to replace the elbow or DDave wand and eliminate the whip, allowing for hands free operation. Additionally, either The Gentleman or The Dirty Pig can be used with the EQ to fill balloons for maximum pleasure when vaping. Direct Draw Functionality allows you to ditch the whip. The Direct Draw Mouthpiece can be used with either The Gentleman or The Dirty Pig, and for hands free whip free usage or to fill balloons. Stevenski, BD9, ddave and 4 others like this. Stevenski, BD9, ddave and 3 others like this. Stevenski, BD9, arb and 3 others like this. I have been trashed since I first tried The Gentleman. Trashed for days. The wands are so easy to use. I just clipped on the Direct Draw Mouthpiece, filled the basket, heated her up, and it was a Whoa- Nelly-Bar-The- Door, nope-it's- too-late -I'm-Super -High high pretty much since then. I've lost days. It's Thursday. This set up is ideal if you are older, infirm or just busy using your hands for other things. You don't have to hold a wand. You load the basket, or have your caregiver, roommate, spouse, lover et al load it for you, then all you do is Dip your head, Sip gently the Vapor, and watch while your skull is Ripped from your head. Dip. Sip. Rip. I took notes. Stupid notes. The Dirty Pig kept me busy the next day, and he was dirty. The wand has a glass screen, and little bits of ABV get pulled into the wand. There are optional small screen baskets for the Direct Draw Mouthpiece, and I used one with mine. It wasn't strictly needed, but I was planning on going through a few baskets and wanted it covered. The small basket is far from the heat, and remains cool during use making it ideal for use with the glass screened Dirty Pig. At the end of the day, I put the Dirty Pig in a zip top snack bag with some salt, and shook it clean. In between times was a bit of a blur. There was a lot of just gently leaning over for a taste of vapor. I looked like one of those toy drinking birds. Only it was weed, not water. Still testing! Because I'm diligent and still miss deadlines! After trying The Gentleman and The Dirty Pig, I decided to try them sharing the load. I coarsely ground my herb, and vaped until vaked. Later, I finely ground the herb/ABV mixture, then finished off with The Gentleman. Haha, I almost said cowboy. After that, balloon party! I hadn't done a balloon in awhile, but I sure did do it this time. I used a turkey bag -a preused turkey bag, and used the work-in-progress-fill-the -bag -option. It works great, but DDave says there maybe other additions to the bag operation in the future. I forgot how potent a bag can be, and if I hadn't wanted to try The Gentleman and The Dirty Pig with water, I'd be bagging it still. This is the thing you always wanted, and never want to be without. This is a miraculous surprise. Innovative, flexible, and both utilitarian and sexxy. I've tried the Gentleman both with and without water. Total love without the whip. What freedom. What instant gratification. This is the This I've been waiting for. Just bend, kiss, sip. Truly hands free. I love my Solo and Air. I do, but if I'm sitting next to my plugged in EQ I feel sheepish using a portable for no other reason than to avoid a whip. I don't dislike whips. I prefer them to bags. You can change up the length. They allow vapor space to cool. You can buy them in fun colors. As much as I'm pro whip, I don't want a whip all of the time. They often require more finesse than I am able and willing to muster. While not disposible, they aren't exactly long lived, and will end up in a landfill far longer than they were ever used. All glass is that leap to a pure air path and environmentally caring path. I can see if a person were elderly, infirm or unwell, that a spouse or caregiver could fill up a basket, set up the Arizer EQ in Gentleman position, and the patient would merely have to lean over to medicate. A person with Parkinson's, arthritis, or other ailment of hand or nerves, could easily use the Gentleman or The Dirty Pig. Equally as useful, a student need not put down her tablet, a gamer need not put down her controller, a viewer his remote. You wouldn't have to put down your sandwich, or chips. Bow and Boom! Just like that, Duck and Cover. Dip and Sip. So convenient. This is effortless stonerism at it's height. Through water the Gentleman is Epic. Glass gleams, the whip coils, and you suddenly want beakers and Bunsen burners, and a Stormy night. You have vapor distilling into a mad scientist's fevered dream. Throw in some tongs, and this is magic with a laboratory set piece. The Gentleman mates beautifully with a waterpiece, without the kinking of the whip as from a straight wand. Bent is better, as it so often is. Something about the Gentleman makes him a force to be reckoned with, and I'm in the reckoning stages. I don't feel hungover as much as still high. But then, the could be from trying out The Dirty Pig. Stevenski, BD9, arb and 2 others like this. @Madri-Gal Thanks for opening this discussion, introducing the new pieces, and for giving them a test run! Well done and well said! Could this be the start of The EQ Log Vape? @ddave I just want to know one thing; was @Madri-Gal involved with naming these? Really great accessory additions to the EQ! Stevenski, just_tHe_fLu, BD9 and 3 others like this. Stevenski, just_tHe_fLu, arb and 3 others like this. She may never be the same again...........lolz. Stevenski, ddave, momofthegoons and 2 others like this. Any change is for the better, I hope. Let's blame the transformative experience of using The Gentleman and The Dirty Pig for any alteration in my state of being. Stevenski, ddave, arb and 2 others like this.